1. Place a small amount of olive oil in a frying pan over medium heat and allow it to warm up. 2. Spread the sundried tomato pesto evenly over both sides of the bread. 3. Wash the spinach and pat it dry with a paper towel. 4. To slice your avocado, first cut your avocado in half, then gently twist the halves apart. Slice one half of the avocado into 1/2 inch slices lengthwise, then peel each slice off the avocado’s skin. 5. Arrange the sliced mozzarella over one side of the bread. Top it with the avocado slices, followed by the baby spinach, then place the other piece of bread on the spinach. The bulky spinach will wilt once it’s over the heat, so don’t worry about your sandwich being too bulky. 6. Grill each side of the sandwich for 5-10 minutes, depending on how toasty you like your bread. Make sure you keep an eye on it, as the pan may be quite hot. 7. Once it’s ready, slice your sandwich in half and enjoy! 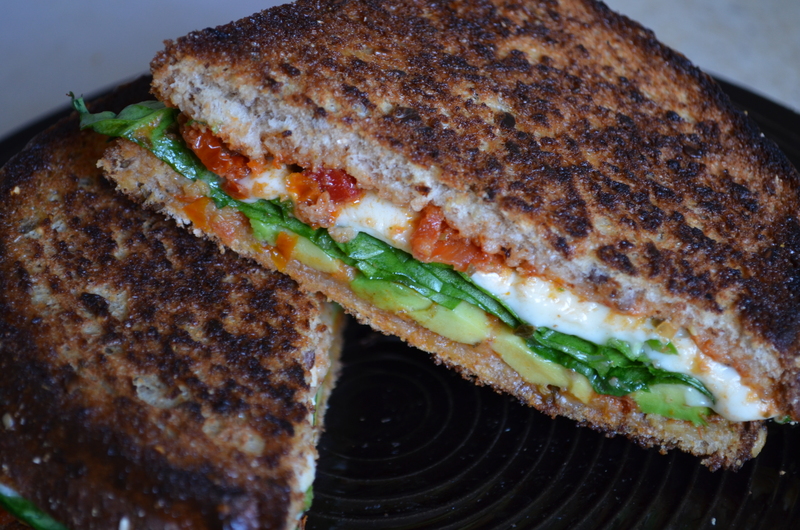 This entry was posted in Entrées, Greens, Quick Meals, Vegetables, Vegetarian and tagged avocado, cheese, easy, grilled, grilled cheese, lunch, quick, sandwich, spinach, vegetarian by laratboulos. Bookmark the permalink. Yum! You’re making me hungry. 🙂 Thanks for posting. Love your blog! Thank you!!! Happy cooking and eating!